This book was published in 2012, received lots of kudos and attention, and has been reviewed plenty. But since it’s my contention that this book is worthy of additional kudos and attention, I’m throwing my hat in the ring. 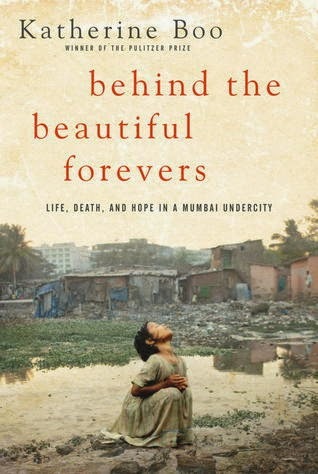 Katherine Boo, a journalist who won a Pulitzer for writing about poverty in the United States, fell in love with an Indian and moved to Mumbai. She understood immediately that someone should bring the abject poverty of prosperous cities’ undercities to light; but being American, she felt unqualified. But she decided to try nonetheless. Three years, one interpreter, hundreds of interviews, and hours of footage later, she wrote this book. Since Katherine Boo uses actual words and phrasings of the slum dwellers, the prose is simple -- while managing to be incredibly powerful. It’s almost incomprehensible to me that the stories in the book actually happened -- and that similar horrific experiences are very likely being played out in different parts of the world even as I write this review. Watching (from a virtual front seat) as the government exploits the poor, the poor exploit the poorer, and the poorer exploit the destitute -- all so that they will have money for food or urgent health care or basic education or to pay a bribe to free an unjustly accused family member from jail -- is both eye-opening and beyond heartbreaking. Not to mention numerous untimely deaths that are a direct result of poor health and healthcare, abject poverty, and absolute desperation. Moral absolutes, to me, have always seemed pretty much absolute. But reading this book helped me (at least begin to) understand that if the high ground I have stood on all my life were to suddenly crumble beneath me -- and I had to decide between, say, saving my child’s life and doing something I have always considered reprehensible -- my moral absolutes might not be so absolute anymore. Reading this book makes me want to take action, but I feel powerless and at a loss. The first step, though, is knowing -- so I guess I’ve taken that first step. Overall, this book is unbelievably heartbreaking -- and it seems (contrary to the message in the title) that hope simply can’t be found in the lives of these people. But I looked closely, and I found it. Not much, not often enough, but hope does exist. That some people in Annawadi are able to use such a small amount of hope to sustain them is a testament to the human spirit. And to the power of hope. That people live in such conditions is a testament that all is most definitely not right -- or fair -- with the world.